result in astronomers focusing on certain research areas. The cold dust and gas between stars emits primarily infrared radiation. This material is a comparatively easy target for infrared astronomers, and has become one of the main subjects of infrared astronomy. In the cold interstellar medium (easily observed in the infrared) new stars are born. Star formation in our Milky Way Galaxy is one of the hot topics of infrared astronomy. 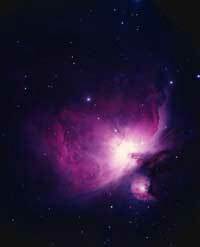 The nearest star-forming region in our galaxy is a cloud of gas and dust in the constellation Orion. With a magnitude of 4.0, it can be easily seen during winter by the naked eye. The University of Lethbridge's Dr. David Naylor has been studying this unique region of the sky for many years. Infrared radiation can travel much greater distances than visible light, opening a window to remote parts of the universe. At the point visible light fades during its journey to us, infrared light is still intact. In general, objects that are distant appear very small and dim. In order for these distant objects to be seen, they would have to be large and bright. Individual stars at these incredible distances are too small and dim to be seen. 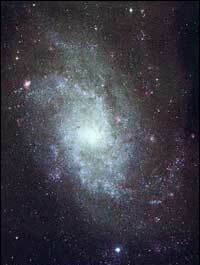 However, galaxies typically consist of millions of stars dispersed over a very large area, emitting plenty of light. A favorite area for infrared astronomers is the study of extremely remote and ancient galaxies, with a goal of determining the origins of our universe.